If the $49 DigiLand tablet I posted on Saturday is too big for you, you might be interested in this cut down version. While digging through the Best Buy website I came across an old frenemy which has appeared under many names. The Skytex Skypad SP458 is the latest iteration of a device that has been appearing under one brand or another for 3 years now, and I think it might finally be the one worth buying. 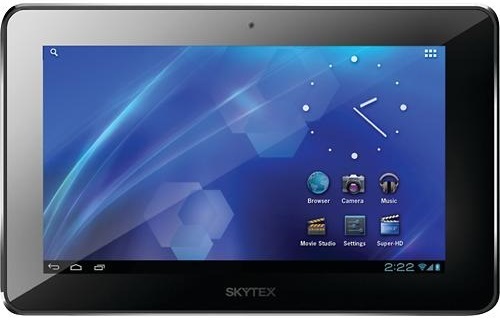 What the Skytex STEXSP458 lacks in screen area, it makes up for in price. This 4.3" tablet might not have a high resolution screen but it does have a dual-core CPU, 2MP camera, and more storage than your average ultra-cheap Android tablet. This tablet runs Android 4.1 on a 1.6GHz dual-core Rockchip CPU with 512MB RAM, a Mali 400 GPU, Wifi, 8GB internal storage, and a microSD card slot. It lacks fripperies like Bluetooth and Google Play, but it does have a camera with a decent resolution. Now if only we could say the same about the screen. This could be good or bad, but this tablet is using the same low resolution screen which I found on the eMatic Twig 3 years ago. The screen resolution is a bizarre 480 x 272, a legacy of the original source for this screen size (DVD players). I don't know how many are still being made, but the 4.3" screen is a common size for DVD players (from ten years ago), and whoever originally designed the STEXSP458 must have bought the screen cheap and in bulk. So would I recommend this tablet? If you're willing to take a chance that it will be crap, sure. I'm tempted to get it just to see if cheap Android tablets in this size range are any better than the ones I tried in late 2011 early 2012. They were junk 3 years ago, but that might no longer be true. And this could be a good reason to start posting reviews again. Is anyone else willing to gamble with this device? It could be fun. No, it’s not. The product listing lied about the CPU’s speed, maker, and the number of cores. It’s running on a single-core 1GHz Allwinner chip. It has less than 512MB RAM, and the two cameras are only VGA resolution, not the 2MP mentioned in the product listing.